Excellent ideal for the sportive cyclist. All the tools a rider must have at a very good quality . Great kit, ideal for basic stuff at home. All the tools needed for a small apartment dweller. I would have loved it if it came with spanners to service cup and cone hubs but there's a more expensive tool box for that. 4 stars only because the accompanying hex wrenches are not really good quality. Used the kit to change wheels, cassette and chain. This is the first time I've done this and the tool kit gave me everything I needed and lots more besides. Other than a torque wrench, which I'll buy separately when I really need one, I can't think of anything else that I'll ever need. Quality of tools appears good and for the price they were excellent value having looked at similar sets for other vendors. Service from Merlin was spot on with the item delivered promptly, well within the stated estimate and the delivery firm gave me a delivery slot so that I could ensure that somebody was home to collect. All in all, very satisfied with the whole experience and would definitely use Merlin again. Thanks! Bought to replace Shimano chain, bottom bracket and cassette. Tools are of decent quality - not rubbish but not top spec - but for the money terrific value. Ideal for occasional use and nice to have almost everything you need in one box. Speed of processing and delivery excellent. I think this tool kit is better than all the others at this price, more compact box which does not spill the tools out when you open it. Tools have the feel of being slightly better quality and looking a bit better one tends to keep them cleaner ! Very happy. A really good place to start assembling your own bike workshop. This kit contains loads of essential tools and nothing you don't need. The only things letting the side down slightly are the screwdriver and the chain-link tool, but both seem to do an okay job and can be replaced easily enough anyway. Great bit of kit, great price, great service from Merlin. Great tool kit, everything I needed with tools as good a quality as the higher end. The ability to use tools with the 8mm Allen key is a great feature for handy use. The chain tool is also handy to bring with you on the bike as it does not take up much space and also is big enough to use with ease. Tool kit with everything that you need to get started on maintaining bikes. I purchased this toolkit to build a new bike from scratch. The kit contains everything you would need to acheive this apart from a torque wrench and wire cutters but these would be items that you wouldn't expect to get in a kit of this price point. The metal components are of a good qualty, ensuring a confident application to the job in hand. The case is durable, well constructed and all the tools snap into the case with ease and are held well so no falling out as you shut the case! Excellent toolkit. Contains all you'll ever need to maintain any bike and at a much better price than buying the tools individually. Great little tool kit, has all the tools for most jobs. Tools seem hard wearing. Good tool kit, built my first bike with this. No noticeble quality issues. Great starter set at a very good price. Great tool box for a newbie like myself! great tool set, everything you need in it! Excellent starter kit everthing you need to carry out simple works on bike. Also well built as expected from IceToolz have owned in the past. The price excellent highly recommend in tool collection. Fantastic little toolkit, used half of the tools already to restore my ten year old GT mountain bike. Even if you don't need everything in it it's still good value when compared to buying things individually. Excellent toolkit for the price, does exactly what it says on the tin! I wish I had brought one of these ages ago it makes life so much easier. Nice starter tool kit. Has all you need to keep your bike working day to day. Great kit for home mechanics. It has everything I need and the pieces have incredible quality. I'm realy glad I've found this kit at this price. Great tool kit with quality tools at a good price. It has paid for itself already avoiding bike shop charges for jobs I now know how to do. No useless cheap filler items. The case is also solid but compact with good sliding fastenings that keep it closed, they won't just break as on cheaper tool kits. Very happy with the tool kit. What a fantastic service, ordered this on my mobile phone at 15.15 on a friday afternoon, it arrived the next day. As for the product, an excellant box of tools, I am at the moment renovating an old 1987 raleigh and needed the tools to remove the parts ready for the respray, I could not have stripped it down without it, although I struggled to get the old fixed cup off the bottom bracket the tools in the box will be useful when I start putting the bike back together, especially with a sealed bottom bracket. Would recommend this kit to anyone with a modern bike. This tool kit has everything you need for a modern bike. Missing some tools that you might need to service a bike from the 80's, but if you have a bike from the last 20 years this tool kit has everything you need at a very good price. Excellent piece of kit, even more so when picked up at the sale price, cannot grumble for the price! Got the email telling me these were back in stock. Placed my order and 2days later it arrived. Excellent service as usual. Kit is very good for the home mechanic. Adjustable spanner, 8/10mm spanner and reversible screwdriver let the side down. You should have these anyway in your own decent tool kit. The bike specific tools are great though. Don't know why I haven't bought one before?! Let's you do the jobs you've always wanted to do if you only had the right tool, now you can and safely! Bought this tool kit to help service and maintain a couple of mountain bikes that have been stored for many years and ridden infrequently. Being retired I now have more time available to do this and having the proper tools has made my introduction to bike maintenance so much easier to cope with. 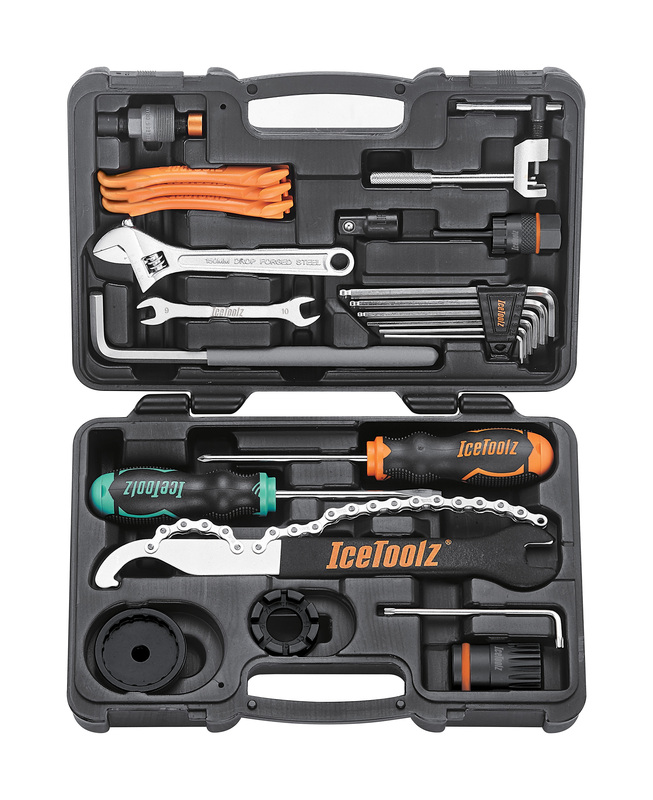 The Icetoolz Essence Tool Kit contains the basic tools required although a set of the common sized cone spanners needed for most bikes would have been a welcome addition. However, I found the quality and workmanship of the supplied tools adequate for my needs. Great value for the money. Some of the bits and peices are a bit on the cheap side with regards their quality and won't last forever but for the price you won't get a better, more comprehensive toolset. On the whole I'd recommend it very highly! I can usually be done if there is a development of this toolkit. Just about everything you need to tear down or to put togather a bike. very useful tools that would cost a lot more if bought seperately.